Please welcome EARTH CAR PEST SERVICES to our Family. EarthCare Pest services was founded in 2002 by Aaron McLeod, Quincy Jones and marketing support from Dave Porter. 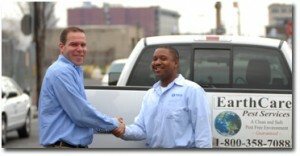 The rich history and the passion of the city of Philadephia is the Heart of EarthCare Pest Services. EarthCare Pest Services is committed to giving pest elimination with the environment in mind. Public health is our primary focus. The University of Purdue Pest Control Technology Program educates our staff. EarthCare Pest Services provides pest elimination for single family homes, appartments and condos in the southeastern Pennsylvania, Delaware and New Jersey areas. We also give termite certifications and treatments for real estate transaction. in the pest elimination industry from people that care about you. As the owner, I want You to be pleased – in fact, absolutely delighted with every pest control job we do. So every job comes with our ironclad, risk free guarantee. What does this mean? Simply this: if you are not happy with our work in our 30 day treatment perod on your home, You can have your money back. Its your choice. Many companies don’t guarantee their work. But we do, nothing is more important than your complete and total satisfaction. We stand behind every job 100%. If you have any questions or concerns about our work, please call us right away. We have products and services to meet all needs and life styles so you and what you value the most are protected.